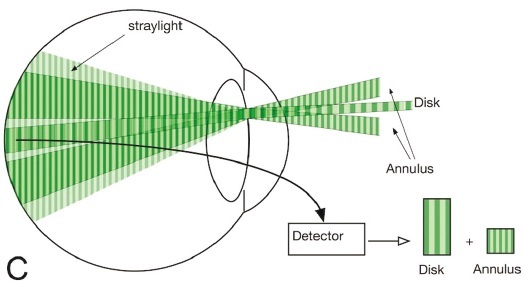 PURPOSE: To measure straylight in a cohort of patients with cataract using a novel optical instrument and to correlate optical straylight values with clinical grade of cataracts and psychophysical straylight values. METHODS: Measurements were performed on 53 eyes of 44 patients with cataract admitted to the ophthalmology service of the university hospital in Murcia, Spain, and 9 young volunteers with no known ophthalmic pathology. Lens opacities were classified according to the Lens Opacities Classification System Ill (LOCS III) under slit-lamp examination. Intraocular straylight was additionally assessed psychophysically using the C-Quant straylight meter (Oculus Optikgeräte GmbH, Wetzlar, Germany). RESULTS: Optical measurements of the logarithm of the straylight parameter ranged from 1.01 to 2.01 (mean: 1.43 ± 0.244) in patients with cataract and 0.80 to 1.08 (mean: 0.92 ± 0.104) in healthy young volunteers. Straylight differed by a statistically significant amount among different LOCS III groups (P < .05). Moreover, the optically measured straylight parameter was positively correlated to the psychophysically estimated value (r = 0.803, P < .05). CONCLUSIONS: A new compact optical instrument suitable for clinical measurements of straylight in the human eye has been developed. Optically measured straylight values were highly correlated to those that were obtained psychophysically. Optical measurement of straylight can be used for the objective classification of cataract opacities based on their optical impact.